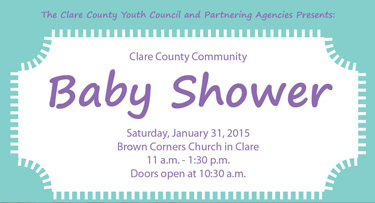 The Clare County Youth Council and Partnering Agencies Presents the Clare County Community Baby Shower. This annual event will be held Saturday, January 31st at the Brown Corners Church in Clare from 11 a.m. - 1:30 p.m. Doors will open at 10:30 a.m. The Baby Shower is for Clare County parents who are expecting a child or who have a child under 12 months old. Those attending on their own may bring one guest. So you can relax and listen, please do not bring children who are mobile. Infants who are not mobile are permitted. Julie Ehle of Mid Michigan Community College will share information about infant development and age-appropriate toys. There will be lots of giveaways and a free tasty meal will be provided! Those who are interested MUST REGISTER. For more information on registration contact Brandi Warner at 386-8644.